then the umpire shall declare it as a No-ball imminently. but not bowling properly (i.e. still throwing the ball), then if umpires catch such action during the match (that is totally up to them) they can call it a no-ball immediately. However, even if they don't catch such illegal bowling actions, the report for the illegal bowling actions is generated by match officials. If any illegal action found they submit the report the the relevant team manager. And process further. You can check the full procedure on Illegal Bowling Actions PDF. 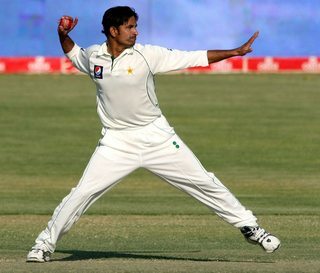 A ball is fairly delivered in respect of the arm if, once the bowler's arm has reached the level of the shoulder in the delivery swing, the elbow joint is not straightened partially or completely from that point until the ball has left the hand. This definition shall not debar a bowler from flexing or rotating the wrist in the delivery swing. A guideline was introduced to allow extensions or hyperextensions of angles up to 15 degrees before deeming the ball illegally thrown. A bowler will be wired up with number of sensors, and Biomechanics experts - Human Movement Specialists monitor the action. If the arm is bent at the onset of the delivery stride but remains rigid or does not flex or extend beyond the permissible 15 degrees during the duration of the stride, the action is not illegal. An action is only illegal if the arm flexes or extends beyond the permissible limit while in the delivery stride.